I have often said to new moms that they should trust that the God who blessed them with a child and allowed them to grow that child within them will also allow them to grow that child outside them. And usually, I have found that the lack of information and support is what was lacking in every story wherein breastfeeding wasn't succesful. It's very crucial for new mothers to know that it's not really just breastfeeding or formula feeding, because breastfeeding can happen and be achieved in many ways. Most problems aren't deal breakers and shouldn't be... and formula feeding, though it has its merits, isn't THE solution for all feeding problems. It's handy, convenient and yes, calorie-rich... but it is also processed and dead. A lot of children now are reistering so many illnesses and handicaps, like allergies, and it would be stupid to deny that our diet had an effect on that. 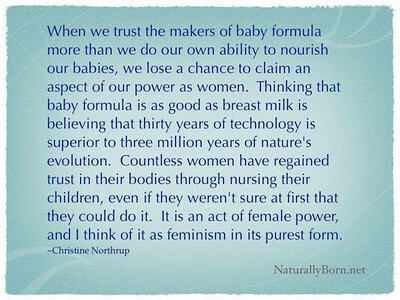 So, who's to say what their problems will be because of formula feeding? And now that there is a crisis again, for sure, there will be a deluge of formula or powdered milk donations. How useful would these be if the people they are given to won't have the sterile water and equipment to prepare it? Sure, it will fill tummies and shush babies, but what happens when these same babies get diarrhea, or catch colds and other infections?